One of the world’s most famous instrumentalists makes a much anticipated return to the VSO stage for a special concert on Wednesday, June 11. 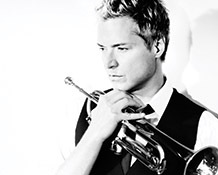 Famed smooth Jazz trumpeter and multi- Grammy® winning trumpeter, Chris Botti, joins the Vancouver Symphony Orchestra and Assistant Conductor Gordon Gerrard, for an evening of famous Jazz standards as well as memorable songs from the popular repertoire. Botti, a frequent collaborator with the Public Broadcasting Station (PBS) in the U.S., is one of today’s busiest musicians. On the road for over 250 days a year, Botti has performed and recorded with some of the world’s most famous and influential musical artists, including Frank Sinatra, Sting, Josh Groban, Michael Bublé, Paul Simon, Joni Mitchell, John Mayer, Andrea Bocelli, Joshua Bell and Aerosmith’s own Steven Tyler. In a concert of beautiful, romantic music for solo trumpet laid on the backdrop of lush arrangements for strings, the evening promises to be one to sell out quickly. Wednesday, June 11, 8pm, Orpheum Theatre.